How can than in the future broad demonstrations contribute to uniting a movement? It is necessary to start by stating the truth. The demonstration was divided twice. Firstly physically by the lack of interest or capacity to confront the repressive Danish political culture and provocations. Secondly because the masses in the demonstration was allowed to be used by organizations to promote their self interest rather than as a common force in challenging the political agenda. 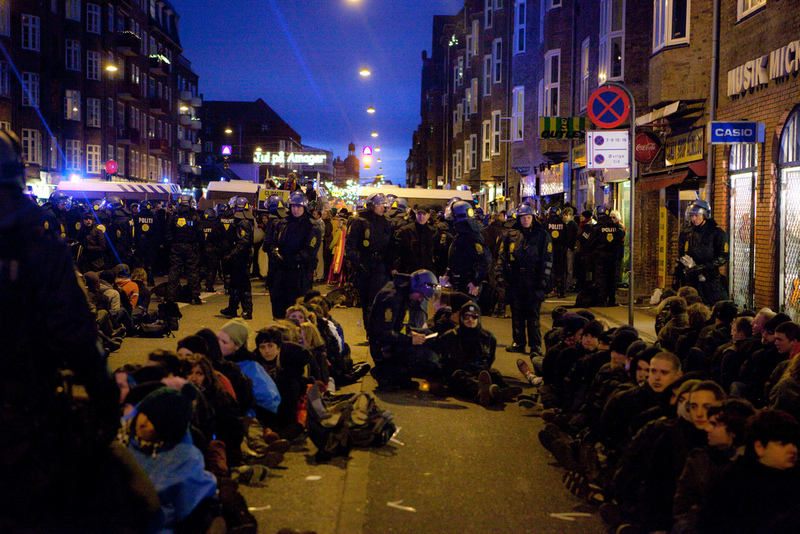 What happened on December 12 in Copenhagen was destruction of trust in a democratically organized demonstration. The branding mentality of both NGOs and left wing parties turned the collective manifestation into a decoration for sending messages via mass media to politicians and people. The collective democratic duty to protect the integrity of the demonstration was replaced by the effort to compete with other organizations to appear as the right choice to support for preselected target groups. Thus what we could see on the street of Amagerbrogade was the graveyard of democracy as we know it and a Danish committee of organizers fully willing to betray its collective responsibility and instead turn the occasion into a possibility for branding their own names. 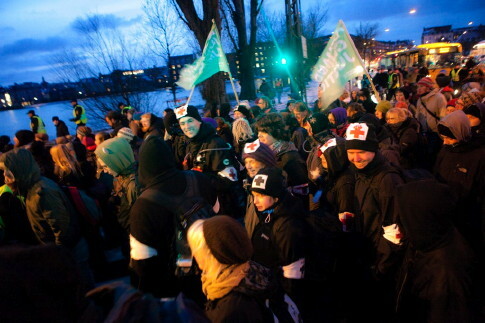 This separation of the demonstration into two, one graveyard and forgotten and one colourful and peaceful manifestation at Bella Center was equally promoted by Greenpeace, social democrats, left wing parties and even independent left wing intellectuals. In its video about the December 12 demonstration Greenpeace only gives a rosy pictures. The strong feelings about attacks on democratic rights and repression at COP15 is primarily directed towards self defence of own well paid directors and activists when they are put into prison, not when people in common are mass arrested. To very many, environmentalists or left wingers, the issue of repression against the December 12 demonstration is disturbing. Something that should not be addressed too much as it takes away the focus from something claimed to be more important, the climate negotiations or something that should be put into the box of routine criticism of the police and the repressive state. Why make the whole demonstration a part of the assessment of the result of the December 12 demonstration when it is so much easier to avoid making the arrests of nearly one thousand demonstrators a central part of understanding what happened. Such an assessment would maybe even open up for some self-criticism for lack of collective response and thus questioning of the whole model for the demonstration, a questioning that would come close to the unquestionable basis of the concept of broadness and full liberty for branding as always better than a platform with some more clear demands or a culture of collective responsibility for solidarity with all demonstrators. There is no excuse whatsoever for letting the police arrest 918 demonstrators because the person or persons that half an hour earlier smashed a bank window in the same section of the demonstration might still be there. It is an insult when the police first guides a group of protesters that had announced to make actions without a strict non-violent code of conduct into the demonstration with a rather predictable result in some broken windows and then claim that what the police did was to protect the demonstration by mass arresting people. And so is the weak individualistic response from the Danish organisers ranging from full support of the police to talks about disproportionate police behaviour. The mass arrest of 918 demonstrators at Amagerbrogade was not disproportionate, it was totally unjustified and an attack on democracy and the whole demonstration. The responsibility for this separation of the demonstration into two parts is not only to be put on the police. The main actors behind the demonstration accepted this separation by refusing both to collectively respond to the assault but also to maintain the separation afterward in the assessment. Even an independent left winger as Karpanschof states the demonstration as at least partly a success while claiming that the direct action were failures including Reclaim power on December 16. His assessment that the mass demonstration was more successful than the other action in Copenhagen is also a conclusion made by many others. But can at all a demonstration were such an extreme amount of people were mass arrested really be stated as even a partly success if the organizers do not make a political analysis of the situation and jointly are able to strengthen both the common climate demands and demands for democratic rights. After all the mass arrest was historically extreme and completely unacceptable. How come that such a successful demonstration could accept this attack on democracy at such a historic stage of international importance? 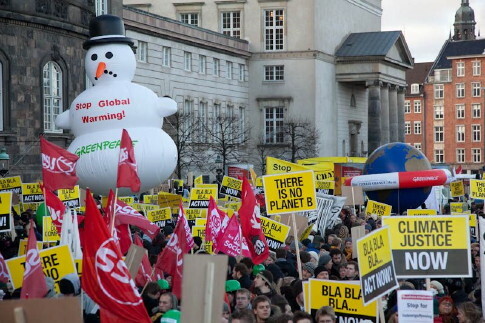 The claims that the mass demonstration was successful while the direct actions were failures becomes especially problematic in the light of that the political force most consistently opposing the attacks on the demonstration was Climate Justice Action. It is the CJA van that tries to return to support the people that have been mass arrested. it is from the same van that people in the demonstration are told the truth about what have happened and calls are made for solidarity. 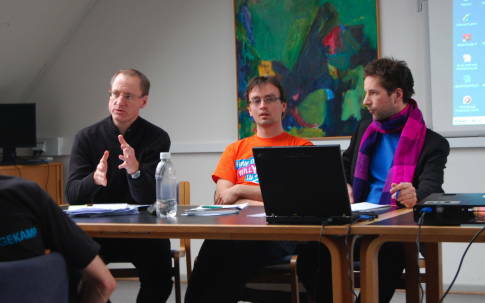 The Danish organizers of the demonstration make competing individual statements, often against each other, and refuses to make any collective efforts opposing the repression. This while CJA continues to organize collective protests with those willing to cooperate. How little interest the Danish organizers and how big interest CJA have in defending all demonstrators and democracy became evident at the demonstration on December 18 against the repression of the climate protests. Here CJA was key organizer while the many Danish organisations responsible for inviting people from the whole world to the December 12 demonstration with very few exception showed their complete lack of solidarity. Once each Danish organization behind the demonstration could gain most out of it for themselves there was very little interest anymore on what happens to democracy when almost one thousand people arbitrary can be arrested in a demonstration the Danish organizations are responsible for. Also in January the main Danish demonstration organizers maintained their individualism while activists belong more to a collective and solidarity culture nurtured by direct actions started networks against the repression and solidarity work. Thus it is not the dominant forces organizing the demonstration on December 12 that are interested in defending democratic rights, it is activist networks based on direct actions. This is true not only in relationship with the state and its police but also in addressing mass media, NGOs, popular movements as well as radical groups. 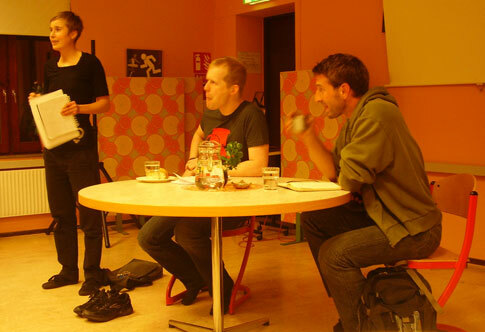 It is CJA that most consistently tries to politicize all activities in Copenhagen, and early on with a strict code of non-violence challenges more radical groups. Thus when some of the demonstration organizers attacked CJA as the cause of the repressive measures taken by the government, parliament and the police and claiming the December 16 action as the biggest problem the reality soon became obvious. It was rather December 12 that had problems with its vague political platform and concept of promoting a variety of expressions. Even here it was CJA that most consistently emphasized the need of politicising all protests and challenging Never trust a COP with a strict code of conduct making more for creating political focus on December 12 than the organizers of the demonstration. The basis for many assessments of the demonstration is false when trying to separate the action into different parts. In reality a political assessment must see to the indivisibility of a demonstration as a political fact. The historically arbitrary mass arrest must be explained in terms of its context. The repression of the demonstration is directly linked to the repression inside the negotiation process as part of the present development model. It is not only on the streets that people get arbitrary mass arrested. Also inside the negotiations the whole idea of a United Nations of sovereign equal people was as historically radically erased as the democratic rights outside. This with Denmark in the key position as chairing the conference, to a large extent helped by Sweden in their role as presidency of the EU. Both countries decided to forget about 50 years of efforts from Nordic states to sometimes support opinions from developing countries, being pioneers in bringing up the environmental issues internationally and believing in the UN as a protection of the rights of small nations in international affairs against big powers. Denmark and Sweden used their key positions to have only informal contacts with big powers and openly going against the interests of developing countries to maintain a track for the Kyoto agreement. This in line with the Danish foreign police doctrine to stick to US positions as the main direction and the Swedish position to support Western powers and corporations. The period in world politics when Nordic countries had a balancing position and defended small nations and the UN is over. The polarisation in the world have turned harder between those with material force to impose their power on others and those lacking these resources. Thus instead of promoting the ideal that every human being is equal as a basis for the politics enacted at the COP15 Denmark did the opposite. 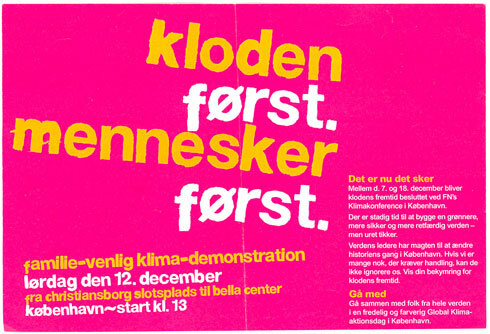 This was well known to popular movements already confronted with the result of the present climate politics and thus they supported unification of a climate justice movement and mass activities in Copenhagen as the Reclaim Power action, 12 December initiative and Klimaforum. Flyer for Planet first people first December 12 demonstration focusing on the power world leaders have to change history in Copenhagen. To many Danish organizers of the December 12 demonstration this was a threat to their social partnership with he Danish state. Instead of addressing the clear political interest of the Danish state to turn the COP15 process into an event to replace UN with ad hoc agreements between big powers and promote Copenhagen as a global center for environmental trading and business the choice was between two main messages. One was to have trust in ”world leaders”, a message explicitly in coherence with the interest of the Danish state, the other a ”real deal”, a message that implicitly could be seen as against the interest of making agreements only between big powers and like minded countries. The rest of the common platform was also lacking explicit demands against the false solutions promoted by Denmark and other states promoting the interests of corporations. When global popular movements came to the conclusion that it was necessary to confront the political content of the COP15 by establishing a People’s assembly by both governmental and NGOs from the inside and a civil disobedience mass action from the outside this caused a break down in the ability of presenting the December 12 platform as politically relevant to the political situation inside the negotiations or in relation to the violence that would be the result if Denmark and other rich countries would have their will come through. Instead of radicalizing the political content of the demonstration in the message on leaflets and by selection of speakers a lot of effort was put into addressing the possibility of violence on the streets. Especially under attack was Reclaim power and mass organisations as Via Campesina and later Never trust a COP. When the violence finally came directed against more than 900 innocent demonstrators the political choices made by the Danish organizers turned into betraying their own demonstration. As there was lack of interest in opposing the violent and false solutions promoted by Denmark and like minded countries inside COP15 in the December 12 platform there was also no interest in opposing the Danish state violence on the streets. 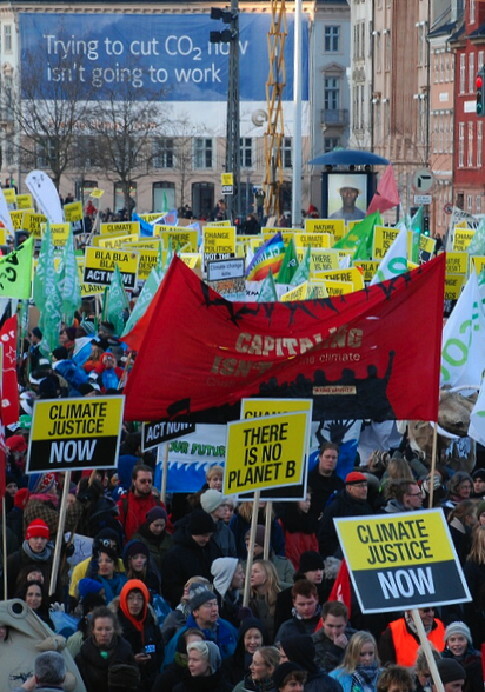 Anticapitalist banner in a green and yellow sea of flags and placards below a blue propaganda advertisement against acting now on cutting CO2 emmissions by the government funded instute led by Björn Lomborg. This kind of popular movement perspective is of course the most important, in the long run. That Tanuro reflects a false media impression of the environmental movement is a problem for the left with their lack of knowledge and interest in respecting other movements than their own. The environmental movement and organizations have as much mobilized on the streets but also in the fields and forests in mass civil disobedience as left wing movements in a scale that is equal to any other movement. The constructive part of this left wing analysis can only become important if the inherent contradictions in the December 12 demonstration are addressed. This must include the relationship between the incapacity to respond to the state violence and the lack of a political platform that opposes violent and false solutions. But it must also include the contradiction between a demonstration that is primarily organized as a back ground for different branding operations by competing organizations within the limitations of the present media logic and a broad rank-and-file mass manifestation. This is not a simple question were organizations claiming themselves to be ideologically radical states that environmental NGOs as a whole are bad. 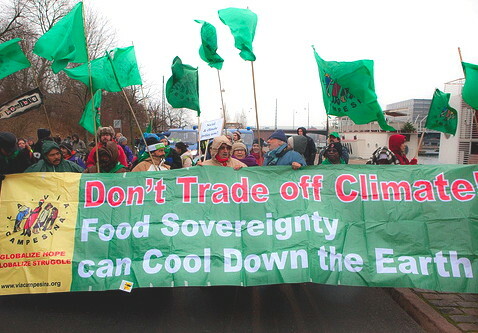 Contrary to some earlier NGO influenced campaigns as Making poverty history in 2005 during the G8 summit in the UK this time the demands made by the broad campaign was not completely possible to use to legitimate the outcome of COP15. Especially the demands for a real deal but also the broad use of climate justice was paving the way for more system critical approaches. It is also true that the mass action on more than 5 000 places on October 24 by 350.org have popularized scientific arguments rather than arguments that puts a main emphasis on trust in business and world leaders as the most important way for solving the climate crisis. We have passed the 1992 Rio conference with its win-win message and obscure sustainable development defined as sustainable growth model for solving the environmental and social crisis and enter a new era. Branding is then a main problem, but not only when environmental and other NGOs use this tactic. Also left wing groups and political parties uses the same problematic methods in the December 12 organizational efforts and especially afterwards the dog fighting between left wing parties was more of a problem than the role played by environmental and other organisations as well as the social liberal party. The way ahead must build more on material analysis than ideological. People do not get mobilized primarily by ideological motivations and differences between competing mobilisations on ideological grounds. This is in the interest of groups either supporting the system in full claiming that the only problem is lack of knowledge or the only problem is lack of ideologically conscious system critical viewpoints in the movement. What is important is to put a focus on material interests as that which have brought Via Campesina to the central point of the mobilizations. A material interest that is not hindered by social partnership limitations or media logics but addresses the daily life issues both in production, consumption and culture. The platform for such cooperation was formed by CJA, CJN and Klimaforum in Copenhagen and can have a positive influence on more indivisible mass demonstrations in the future. Manifestations able of addressing both a broad appeal to people in common all over the planet for what we are against and alternatives, while at the same time opposing jointly repression inside and outside negotiations.